Register your child for one of our film design camps! Rockstar Video - Let out your inner Rockstar by making your own music video! Learn how to produce, direct, and master edit an entire music video. Work together to pick a song that shows off your musical talent, scout locations for your video, and design wardrobes. Music video accessible via download link. Movie Magic - Lights. Camera. Action! Reinforce language, art, math, science, and technological competence. Gain valuable tips, pro tricks, and interpersonal skills while making a short film. Develop script writing, filming, acting, and directing techniques. Access your video via download link. Game Producer - Create a video game and commercial! 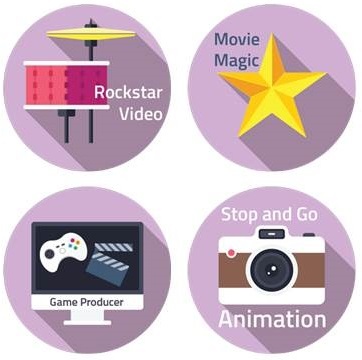 Learn how to produce a video game on your Windows PC. Discover the filmmaking process, including writing, filming, acting, and directing. Design levels, make characters, program movements, and more. Then make a TV commercial that sells your game. Take your game and video home. Stop & Go Animation - Create your very own Lego Movie! Learn the art of film editing, tips to maintain organization, and how to capture still images. Build the sets, produce a script, create the voice overs, and edit stills to bring the movie to life! Access your video via download link.